Composed by Gabrieli. Arranged by James M. Guthrie, ASCAP. Renaissance, Repertoire, Recital. 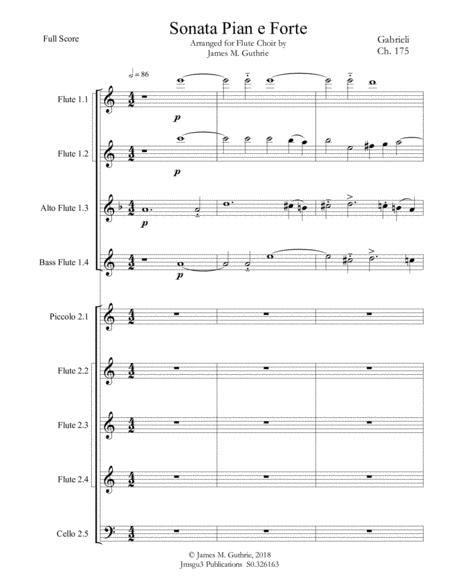 Octavo, Score, Set of Parts. 59 pages. Published by jmsgu3 (S0.326163). A musical monument: the first composition to employ "dynamics." Instrumentation: 1 piccolo, 5 concert flutes, 1 alto flute, 1 bass flute 1 cello. Arranged in two antiphonal choirs. Full Score: 27 pg. 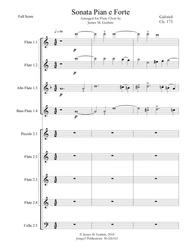 81 ms 4/2, Study Score: 14 pg., Instrumental parts: 2 pg. Duration: 3:45 at half-note = 86.